I haven’t been completely idle during my long posting absence (and won’t be next time I disappear, I’m sure). In fact, I’ve been busy doing all sorts of WoW content, aka mostly complaining about dailies, gearing extremely slowly, being unable to pull together a second raiding team for my guild and therefore not raiding, playing the AH to mild success, and — most importantly — remembering at the last minute I actually want to participate in a holiday celebration. 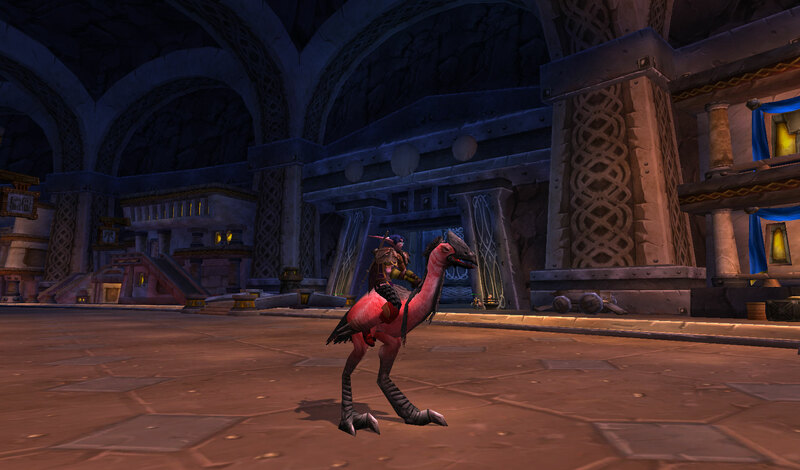 You see, last year I didn’t realize Blizzard had added a new mount, the Swift Lovebird, to the Love Is In The Air event until after the event had finished. 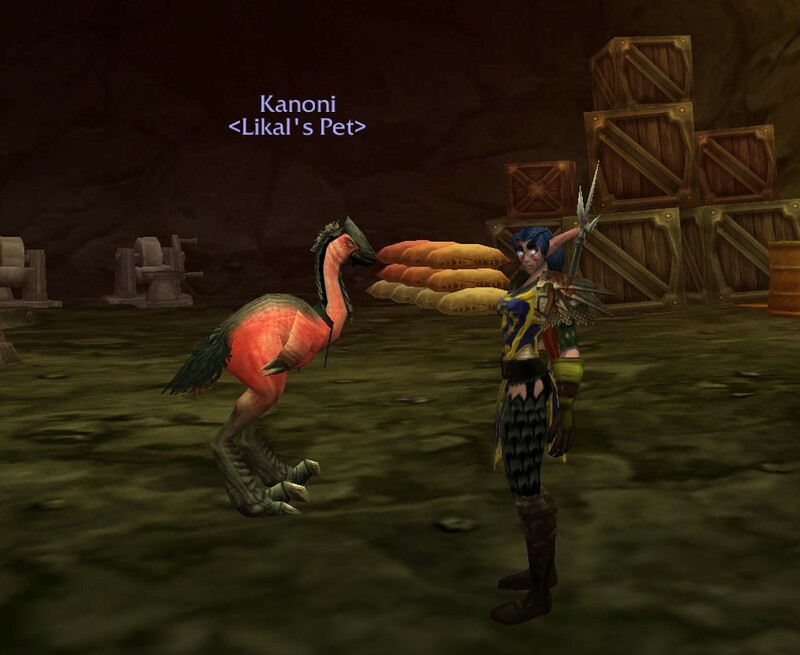 And alas, it was one of my favorite model/skins, the pink tallstrider Mazzranache (two of my many hunters use this as one of their main pets – Mamisha, my Tauren hunter, and Likal, my Night Elf hunter. 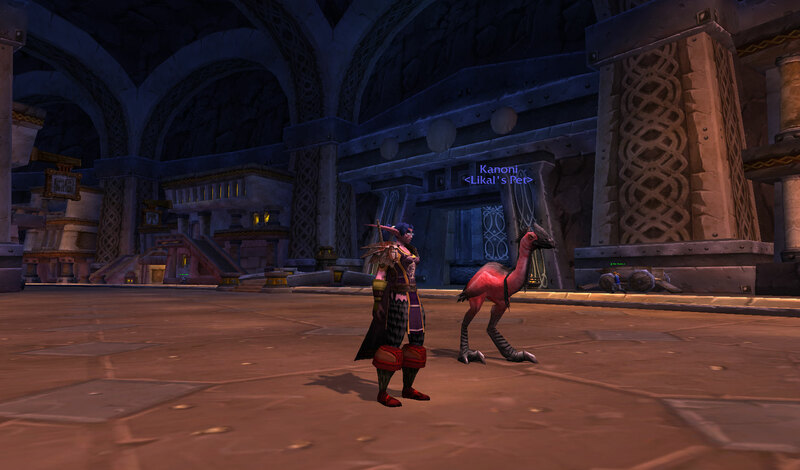 Yet for some reason I had not gotten the Mulgore Hatchling pet until just a few weeks ago when I purchased it off the AH. Wait, I remember why — it has to do with dailies). As soon as I saw the mount I knew I had to get it. 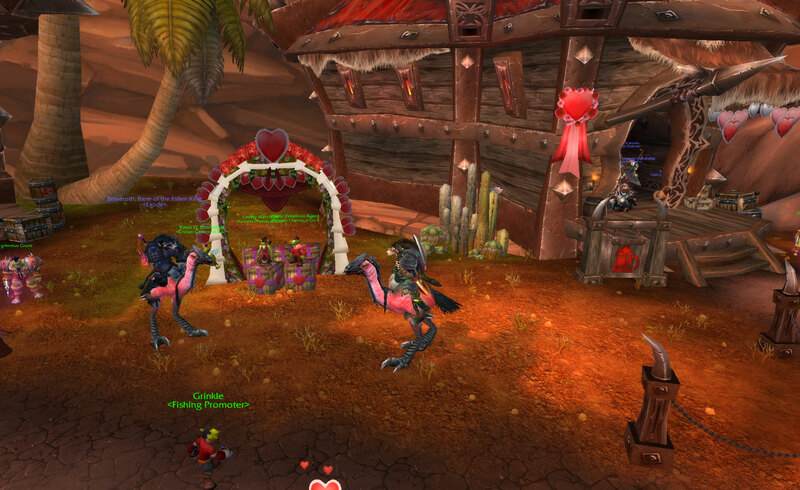 Flash-forward to this year, and on the Wednesday before Love Is In The Air ended I remembered my deep desire for this mount. A bit late there. Nevertheless, I carried on, and with the help of a few guildies and Jed from twitter to get into a farming spot, I got enough tokens to get my very own! 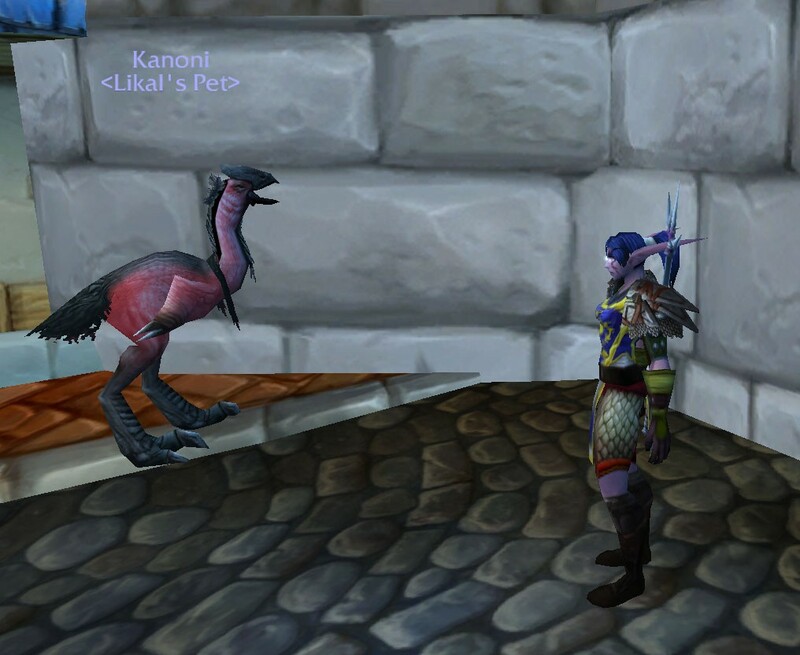 Even more excitingly, my Night Elf hunter Likal, who is on an RP realm, can use the Swift Lovebird as a way to ‘ride’ her pet bird, Kanoni! And here she is riding her pet! 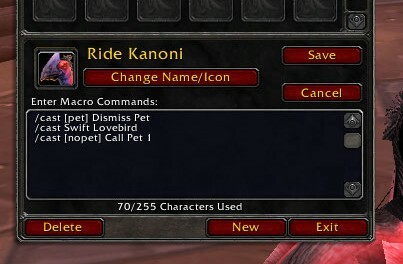 I’ve even made a macro to assist in the mount switching, so two Kanoni’s don’t show up at once! Sure, it takes a little longer to mount up, but it’s totally worth it! (Especially once I get into RPing on the Alliance side again >_> ). 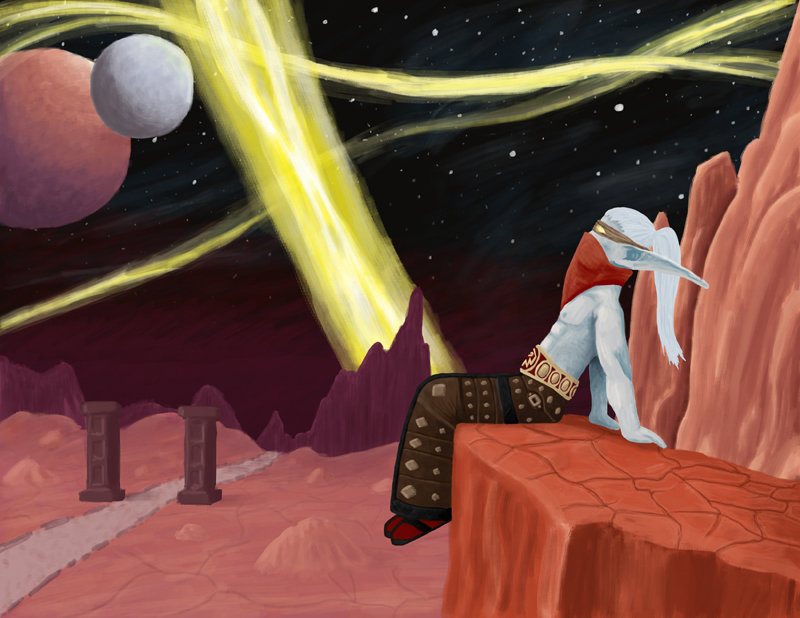 Secret Santa Art Trade 2011 – Now With Art! The Twitter Secret Santa Art Trade 2011 finished late December and was quite successful, if you ask me! Tons of great art are posted on the site, and I’d encourage you to check it out! 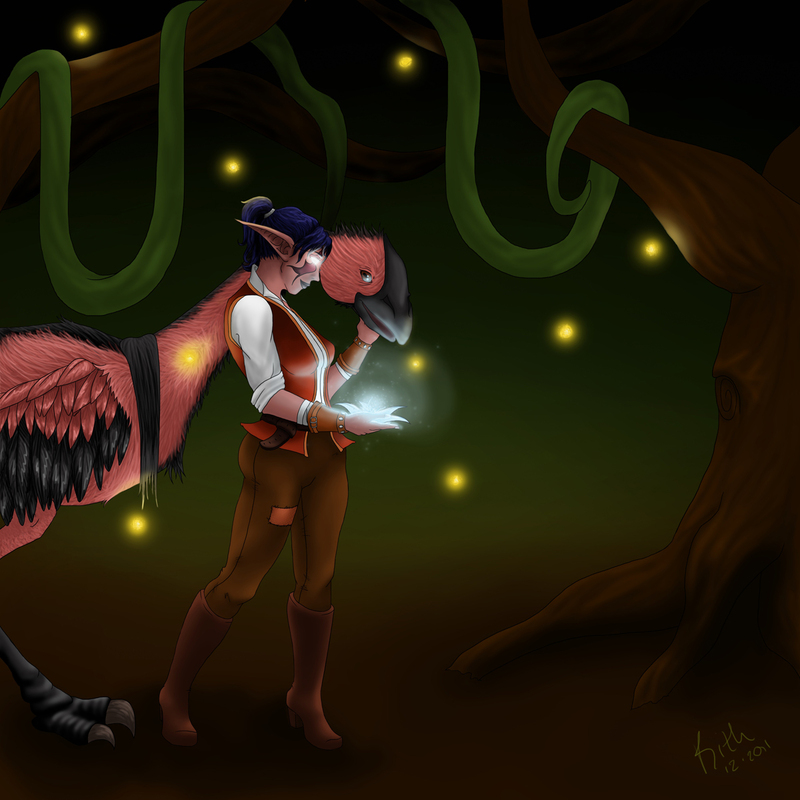 I received my art from @rithtthewarluid, and it’s of Likal, my night elf hunter, and her pet Kanoni! I just love it! I currently have it as my twitter avatar. 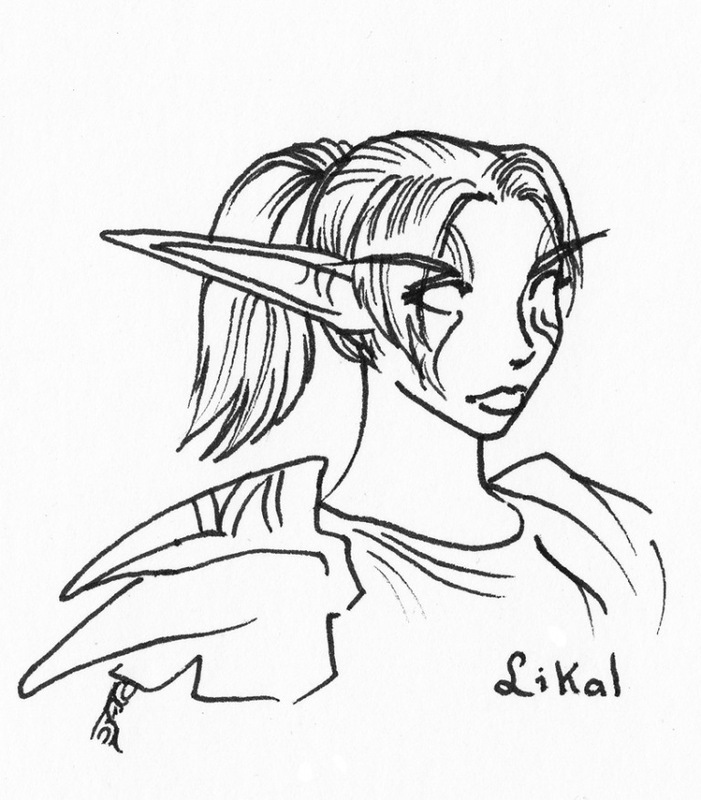 And even more excitingly for Likal, I’ve started playing her again (at least a little bit). She’s ecstatic to get some attention again. Thanks again, Rith! And of course, I ended up making some art too. This year it was for @greyseer! Please not a person with a male character please not a person with a male character please not a person with a – Greyseer? Let’s check out his refs… Doh! No offense Greyseer — I’m just not that good at drawing guys! And I knew I’d have a hard time expressing the awesomeness that is Tharion, because he looks totally badass. In the meantime, you really should go check out all the amazing art that was made! And if you participated, I hope to see you around next year for another year of art trading! Likal, my hunter on Feathermoon, has a problem with pants. I’m sure it’s no fault of her own. Leveling equipment has never been known for it’s… ability to match, at least until Cataclysm came. And even then, the gear from dungeons isn’t the most stellar. Well, they’re not exactly pants, are they. More like long shorts, if anything. And unfortunately, long shorts aren’t really in style with high cut boots like the ones she is sporting. In fact, I would dare say that long shorts made out of mail plating are barely fashionable as it is. As such, especially being on an RP server, I could hardly wait to find a decent upgrade for Likal to replace her silly shorts. Awhile back, Vidyala at Manalicious had a blogoversary. To thank her readers, she offered to do five minute sketches of those who commented on the Blogoversary post. Go on, take a stab in the dark. Well, lots of people commented, actually. Who wouldn’t? 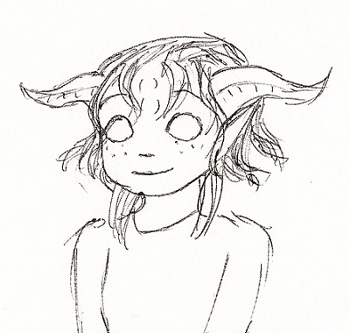 Vidyala is known for her artistic prowess. And in case you are unfamiliar with the prowess I speak of, just check out the Secret Santa piece she did of Mishaweha! In return, as I felt a little guilty for DEMANDING a sketch (can you demand a sketch if it was offered? I propose that you can), I decided to draw a sketch of Vidyala’s main characters — her mage, Millya! I tried to leave it to five minutes or less, but I don’t think it was too bad, in the end. Even though Draenei are filled with lots of complicated parts you have to remember to draw, like horns and tentacles and face bumps. But I remembered the very important freckles! Have you ever tried doing timed sketches before? It’s kinda fun, especially since it excuses any errors you feel you make!